Dallas police officer lights the candles of attendees at the Dallas Strong Candlelight Vigil on Monday. 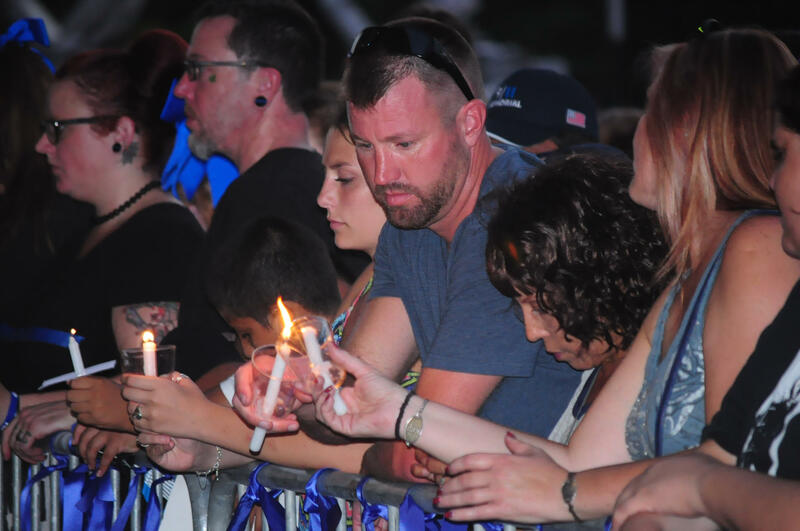 During the closing prayer, the public lit their candles in honor to the deceased police officers during the Dallas Strong Candlelight Vigil on Monday. 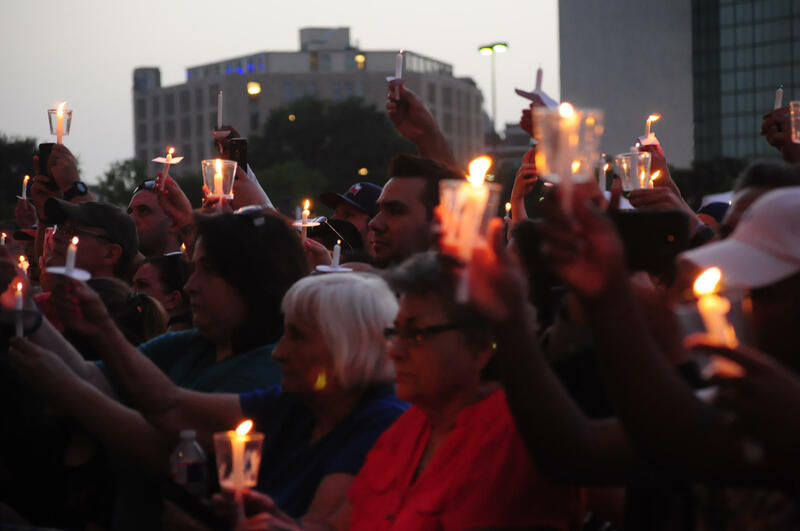 Attendees of Dallas Strong Candlelight Vigil hold up their candles as Chaplain Sean Pease says the closing prayer Monday. 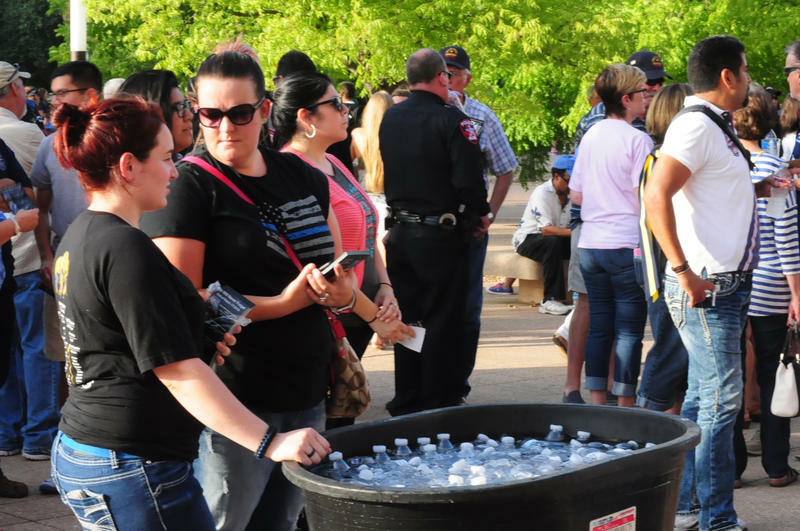 Volunteers Amanda Johnson (left) and Amy Mendoza (right) hand out water and programs to attendees of Dallas Strong Candlelight Vigil on Monday. Police officers praying during Dallas Strong Candlelight Vigil on Monday. 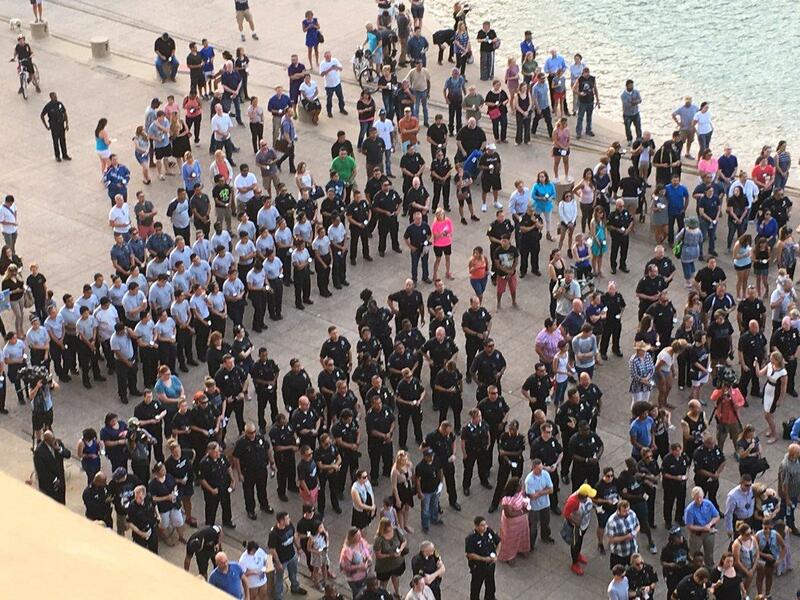 Thousands gathered at Dallas City Hall Monday night to remember the officers killed during last week's shootings. Dallas Police Chief David Brown speaking outside Dallas City Hall during Dallas Strong Candlelight Vigil on Monday. 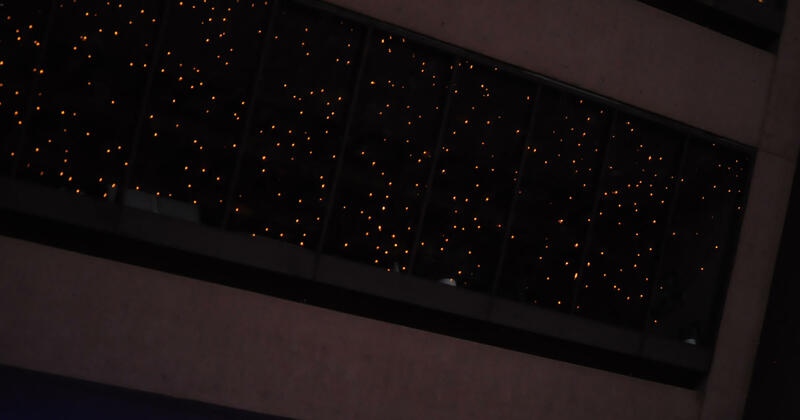 Dallas City Hall windows reflected candlelight from the vigil Monday. 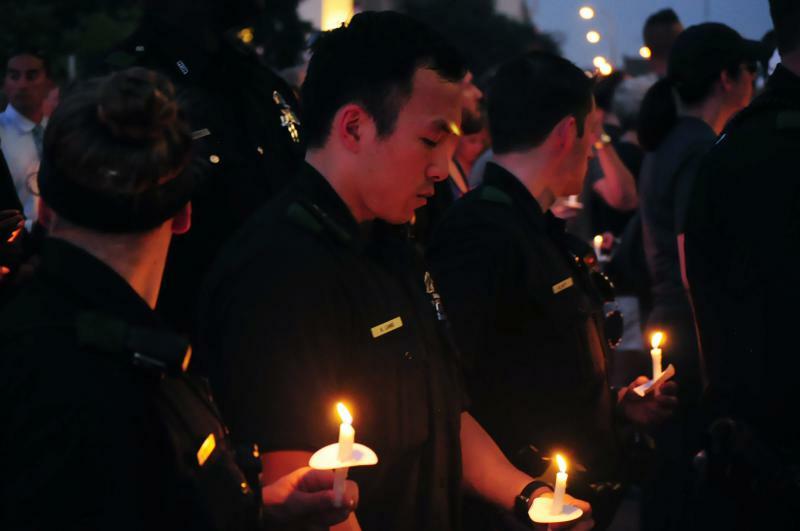 A vigil will be held Monday night in downtown Dallas. 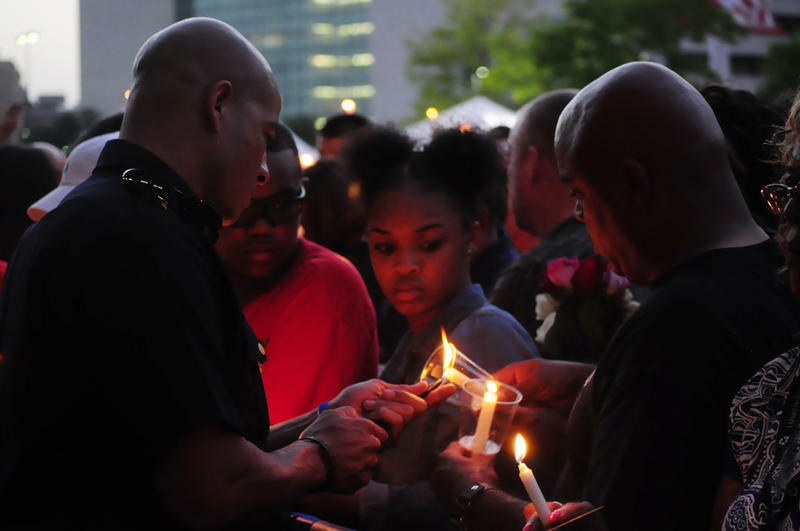 More than 1,000 people gathered for a candlelight vigil in downtown Dallas Monday night to remember the five officers who died during last week's shootings. 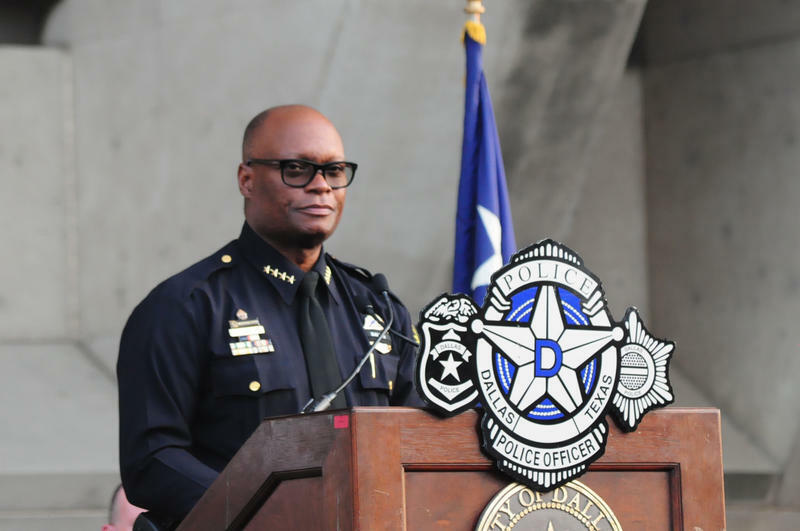 As Dallas Police Chief David Brown took the stage, he was greeted warmly – and with lots of applause. The past few days have been filled with sadness and anger over the killings of five police officers. But Brown and his department have received an outpouring of support from the public. More than a thousand were at the vigil. Brown told the crowd that the fallen officers were superheroes – like Superman. “Faster than a speeding bullet. 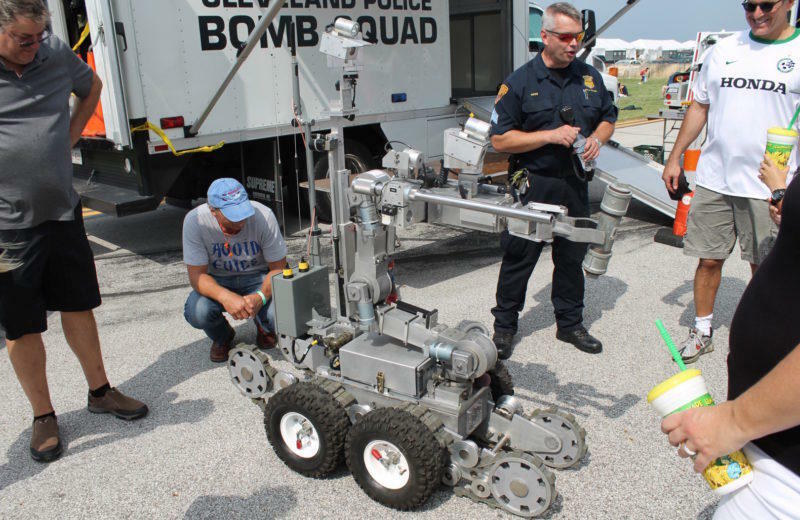 More powerful than a locomotive, able to leap tall buildings in single bound,” Brown said. Families of those superheroes are hurting right now, Brown said. “So what’s our mission today? It’s helping these families understand how to conquer this tragedy,” he said. Among the speakers were friends of the fallen police officers. Like Dallas Police Officer Josh Rodriguez who shared memories of Officer Patrick Zamarripa. He told the story of one of Zamarripa’s last acts – the same day as the shooting. A homeless man had walked up to the officer, complaining that his chips had been stolen. Zamarripa went to a store and bought the man chips and a drink. “He saw no color, nothing mattered to him except that you were human and that is why he is loved so much because of the genuine love and the goodness he had for other people,” Rodriguez said. 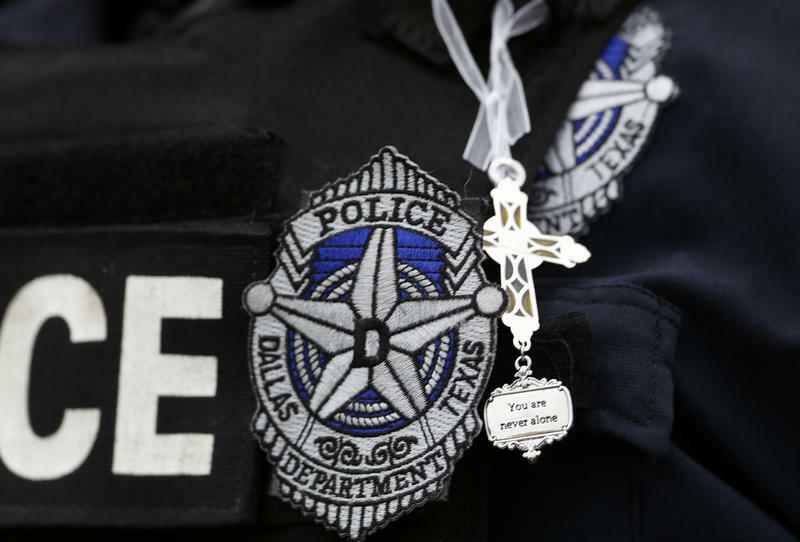 Dallas Sr. Cpl. Marcie St. John spoke about her partner on the beat, Sgt. Michael Smith. She described him as a leader and who loved working. The past few days have been gut-wrenching, she says. St. John said they should channel that emotion toward fostering an environment of hope. Sr. Cpl. Jaime Castro shared stories about Lorne Ahrens. Castro says Ahrens wrote good reports and cited laws word for word. Castro was there when Ahren died in the hospital. Each speaker offered memories of a fallen officer. Officer Josh Rodriguez talked about Officer Patrick Zamarripa. Sr. Cpl. Marcie St. John talked about Sgt. Mike Smith. Melissa Davila was among the thousands who gathered outside City Hall. She carried an American flag and wore a flag scarf to the vigil. She said she came to show support to the officers, to their families and to the city. 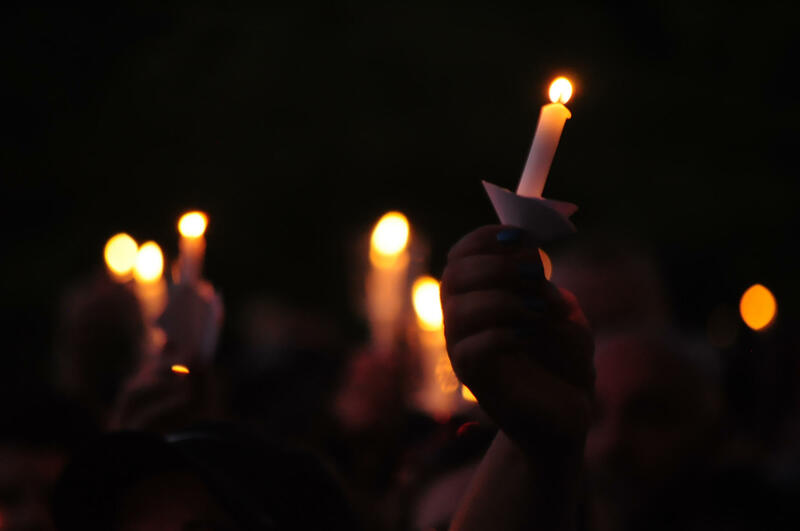 James Hutchins, senior pastor at New Life Community Church in Frisco, was at the vigil. While many talk about wanting better relations between residents and police, Hutchins is doing his part in the Collin County town. 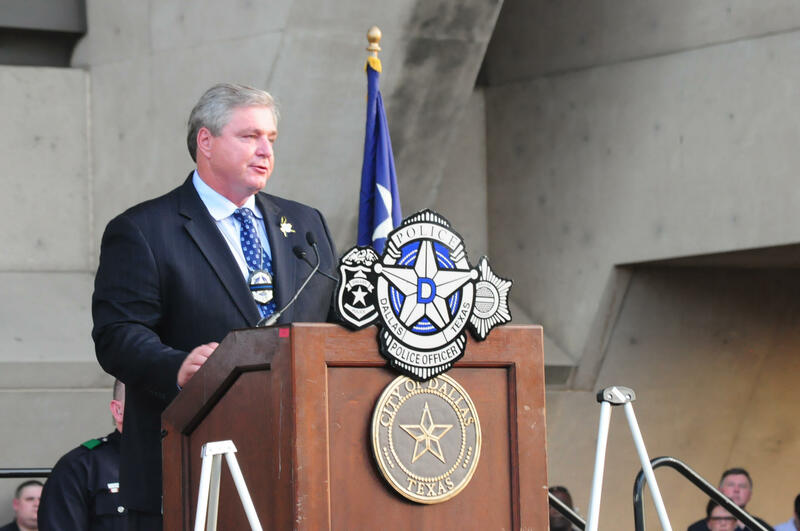 Hutchins has a monthly meeting with an assistant police chief in Frisco – to provide him a perspective for his officers about how the community views law enforcement. “One of our problems is we’re isolated,” Hutchins says. “Isolation isn’t familiarity, it makes you uncomfortable and it perpetuates itself and that’s when you have problems because I don’t see you and you don’t see me of different persuasions, so understanding, coming together and on purpose communicating and trying to understand one another." Hutchins says he sees his role as trying to bridge a gap between residents and police -- and to get a better sense of both sides. 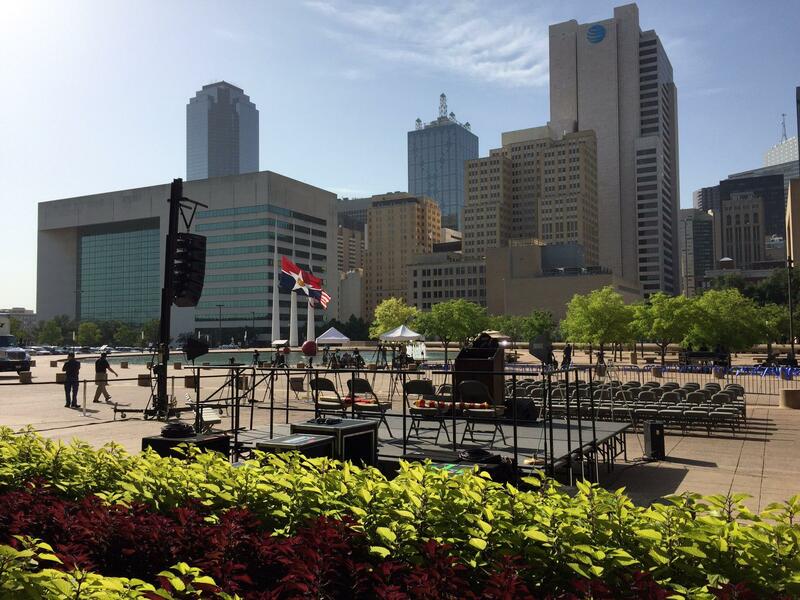 President Barack Obama will arrive in Dallas Tuesday for an interfaith memorial service at the Meyerson Symphony Center in the Arts District. Funeral services have been set for four out of the five fallen officers. Two separate services will be held Wednesday -- honoring Sr. Cpl. Lorne Ahrens and DART officer Brent Thompson. A service for Sgt. Michael Smith is scheduled for Thursday. Officer Patrick Zamarripa will be remembered Saturday. President Barack Obama says the shootings of five Dallas police officers would appear to have exposed the "the deepest fault line of our democracy" but that Americans must reject such despair. 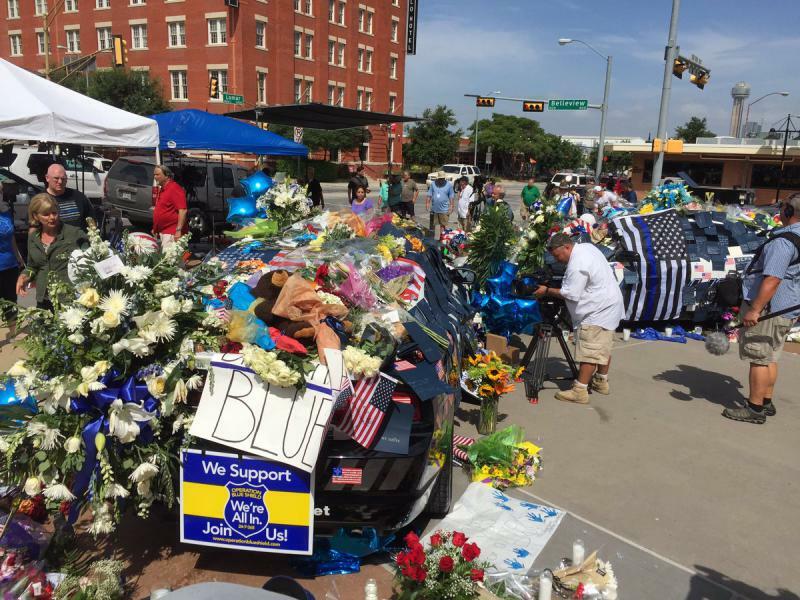 Squad cars in front of Dallas police headquarters have become a makeshift memorial to remember those killed and wounded during the shooting Thursday night in downtown.